One of the many reasons why a lot of people visit Thailand is because of their food. 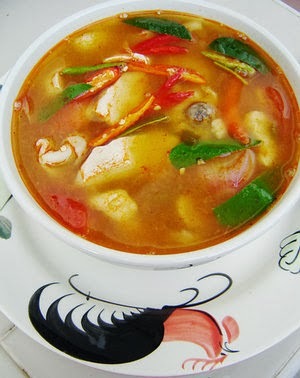 Thai food is regarded by many as one of the best, tastiest, cuisines in the world. No wonder there are lots of Thai restaurants all over the world, and people are embracing it. Its taste is a mixture of different flavors-spices with a touch of different herbs. It's basically a combination of salty, sweet, sour, and spicy. Its ingredients are mostly fresh. I also noticed that Thais put emphasis on the presentation or plating-whether you're eating on the streets or in their cozy restos, excellent food presentation can be seen. Here are some of the Thai food that I recommend you to try in your visit to the Land of Smiles. Shredded unripe papaya with tamarind extract, lime, palm sugar, sugar, fish sauce, tomato, garlic, carrots, chilies, string beans, and peanuts. This dish is my favorite. It is actually a challenge to mix all of these stuff to make the perfect taste. Even Thai chefs have a hard time balancing the taste. But when done perfectly, it's heavenly. This spicy soup is best served hot. Its combination of herbs, spices, and your choice of meat makes it very hard to resist. Another spicy hot soup with galanga, chicken, lemon grass, coconut milk, kaffir lime leaves, coriander leaves, and mushrooms. 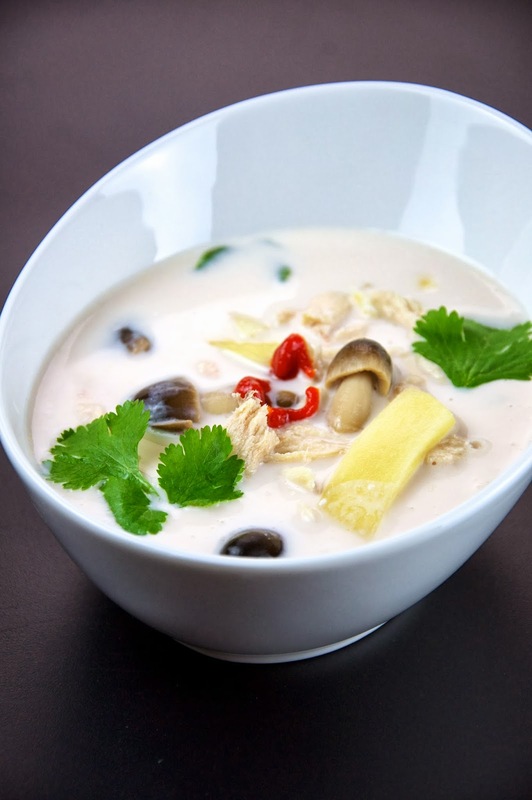 Lovers of viands with coconut milk will surely love this. Those who always go to Thai restaurants are familiar with this dish. It is ever present in Thai restaurants around the world. Well, why not, this is so delicious. This stir-fried rice noodles can be found everywhere-from the streets to food courts in malls. If you want a delicious Pad Thai experience, buy it on the streets of Thailand EXCEPT Khaosan road. I STRONGLY DISCOURAGE the "commercialized", "instant", "touristy" Pad Thai of Khaosan. It is hurriedly done without the right ingredients. It is so bland, tasteless, crappy, fake Pad Thai, done only for profit and to feed hungry budget travelers who don't have a clue. It's not delicious. It's one of the biggest TOURIST TRAPS I have seen in my life. Pad Thais in the malls are also good. This Thai fried rice is an example of how good Thai cooks are. White rice fried with veggies, and/or your choice of meat... and then voila! You have a very delicious meal. Try this and you'll forget Chao Fan. This tasty stir-fried basil leaves with chicken is one of the tastiest, cheapest meals that you can have when exploring the beautiful places in Thailand. It is conveniently present in every restaurant or street hawker. Noodles, who wouldn't like a hot bowl of noodles when in Asia? This Thai noodles, which originated from China and Cambodia is widely available in the kingdom. Locals eat this almost everyday. It's eaten for breakfast, lunch, snack, or dinner. There are many variations to choose from. One of the best desserts in the planet. Sweet ripe mango, sticky rice, and coconut milk-at first it sounded weird, but when I tasted it, it definitely is a winner. Dessert, anyone? Vegetarians, worry not as there's a dish that we can enjoy while roaming the streets of Bangkok. This stir-fried vegetables is a simple Thai dish that is full of flavor. The veggies are usually half-cooked, which make it a delectable and nutritious dish free from cholesterol. Just say "Pad Pak Ruam Jae krup/ka" when you order. These are delectable dishes! Nice post do! I miss eating these types of food.